To Brønnøy on the "Ships starting with B" page. Delivered from Götaverken A/B, Gothenburg (401) in Oct.-1926 as Brønnøy to A/S Borgestad, Porsgrunn. 380.5' x 54.7' x 25.7', 2 x 6 cyl. 4 TEV B&W DM, 2120 bhp. Previous passage Port Alberni, B.C. to Dakar. Nov. 11 Liverpool   OB 242 Dispersed Nov. 15. Apr. 7 Liverpool   OB 307 For Panama. Aug. 10 Milford Haven   ON 6 For Buenos Aires. Apr. 23 Liverpool   ON 89 Detached May 5. Jan. 19 New York City New York City* Jan. 21 NG 338 Returned after collision. May 15 Durban   DN 39 Dispersed May 17. Aug. 13 Durban   DN 56 Dispersed Aug. 14. Oct. 5 Bizerta Gibraltar Oct. 9 GUS 17 Bizerta to Gibraltar for U.K.
Dec. 15 Liverpool   ONS 25 For New York City. Detached indep. to East London, June 18. Oct. 18 Freetown   SL 174 Convoy rendezvoused w/MKS 65, Oct. 30. Dec. 13 Loch Ewe   ONS 38 Convoy will be added. Jan. 21 New York City   NG 485 Detached independent Jan. 27. March 17 Halifax Liverpool March 31 SC 170 Convoy will be added. Apr. 28 Milford Haven   OS 125/KMS 100 For Freetown. Dispersed in 44 26N 10W, May 1. Judging from the information found on Page 1 of the archive documents, it looks like Brønnøy was in Port Alberni when war broke out in Norway on Apr. 9-1940. It'll also be noticed that she occasionally had long stays in port that year. With a cargo of chrome ore, she's listed in Convoy SL 49, which departed Freetown on Sept. 27-1940 and arrived Liverpool on Oct. 17 - Drammensfjord is also named. We later we find Brønnøy, together with Kul, in Convoy OB 242, which left Liverpool on Nov. 11 and dispersed on the 15th, Brønnøy arriving Cristobal independently on Dec. 3. The external website that I've linked to within the Voyage Record has more on these convoys. Having made a voyage to Suva, she returned to Cristobal then on to Bermuda (Page 1), and was scheduled for the Bermuda portion of Convoy HX 112 on Febr. 27-1941 (Beduin and Ferm were sunk, follow links for details), but instead joined the Bermuda portion of Convoy HX 113 a few days later, cargo of sugar for Liverpool, where she arrived on March 22. Early the following month she joined Convoy OB 307, together with Chr. Th. Boe, Dagrun, Drammensfjord, Petter and Thorshavet. This convoy departed Liverpool on Apr. 7 and dispersed on the 13th, Brønnøy arriving Cristobal independently on May 1. Having made a voyage to Tocopilla, she returned to Bermuda again, and with a cargo of nitrates for Newport, she was scheduled for the Bermuda portion of Convoy HX 132 on June 8, but did not sail. She was also cancelled from HX 133 (in which Soløy and Vigrid were sunk, and Kongsgaard was torpedoed and damaged - again, follow the links for more info) and HX 134, but eventually got away with Convoy (B)HX 135 on June 24, and arrived Newport (via Belfast Lough) on July 15. She's later listed as bound for Buenos Aires in the westbound North Atlantic Convoy ON 6, which originated in Liverpool on Aug. 11 and dispersed on the 24th, Brønnøy arriving her destination on Sept. 20, remaining there for over 3 weeks (Page 1). She then made an independent voyage to Trinidad, before proceeding to Sydney, C.B. in order to join a convoy back to the U.K. She was scheduled for the slow Convoy SC 55 on Nov. 16, but instead joined the next convoy on Nov. 22, SC 56, cargo of grain and maize for Leith, where she arrived on Dec. 13, according to Page 2. In Jan.-1942, she's listed in station 44 of Convoy OS 16, voyage Oban-Freetown. This convoy, which originated in Liverpool on Jan. 5 and arrived Freetown on the 23rd, also included the Norwegian Bernhard, Kattegat, L. A. Christensen, Rio Branco and Slemmestad, as well as the Panamanian Norvinn, which had Norwegian managers and is, therefore, listed under the N's of this website. Solstad and Vinga were scheduled, but did not sail (note that they were not all bound for Freetown - ref. convoy link provided in the table above). In March that same year, she headed in the other direction with Convoy SL 102, departing Freetown on March 4, arriving Liverpool on the 26th (link in Voyage Record). She had again been in the company of other Norwegian ships, namely Belnor, Cypria and Velox. Brønnøy now remained in Liverpool for almost a month, before joining the westbound North Atlantic Convoy ON 89*, leaving Liverpool on Apr. 23. Cypria was again in company, as were Haakon Hauan, Hamlet, Nueva Granada, Pan Aruba, Samuel Bakke and Torvanger. ON 89 arrived Halifax on May 5, but Brønnøy detached from the convoy that day in order to proceed to New York, where she arrived on May 7. Her subsequent voyages are shown on Page 2 and Page 3, while convoy information for some of them can be found in the Voyage Record above. Occasional long stays in port are shown. Skipping now to Sept.-1943, when she (according to A. Hague) made a voyage from Tripoli to Bizerta with Convoy MKS 26 (scroll down to the second table on that page). It'll be noticed that Tripoli is not mentioned on the archive document (Page 3), which says she arrived Bizerta on Sept. 30, having sailed from Alexandria on Sept. 22. From Bizerta, she proceeded to Gibraltar on Oct. 5 (convoy info in Voyage Record), subsequently joining Convoy MKS 27 from there to the U.K. on Oct. 14, together with the Norwegian Sneland I and Toronto. Brønnøy arrived Liverpool on Oct. 29, continuing to Manchester that same day. We later find her in the westbound North Atlantic Convoy ONS 25*, along with Danio, Minerva, Sommerstad and Veni. This convoy left Liverpool on Dec. 15 and arrived Halifax on Jan. 3-1944, but Brønnøy's destination was New York, where she arrived on Jan. 6. Her 1944 voyages start on Page 3, with convoy information for some of them in the table above - as can be seen, she had a long stay in Boston at the beginning of that year, with another long stay in New York later on. She was back in Freetown in Oct.-1944, joining Convoy SL 174, voyage Rosario-Falmouth, cargo of linseed and general, carrying 1 passenger. The SL portion of this convoy (in which Brønnøy sailed) departed Freetown on Oct. 18 and joined up with Convoy MKS 65* from Gibraltar on Oct. 30, the combined convoy arriving Liverpool on Nov. 7. The Norwegian Jenny, Kristianiafjord and Norelg are also included (the latter joining with the MKS portion from Gibraltar, while the other 2 were in the SL convoy - see the links provided within the Voyage Record above). Judging from the information on Page 3, Brønnøy subsequently went to King George V Dock. That year was rounded off with another voyage to New York. She had sailed in Convoy ONS 38*, which originated in Liverpool on Dec. 13 and arrived Halifax on Jan. 2-1945. Brønnøy, however, had started out in Loch Ewe and arrived New York on Jan. 5. Norelg, Rutenfjell and Stirlingville also took part in ONS 38. Brønnøy's voyages in this period are shown on Page 4, which lists most of her 1945 voyages (with convoy details in the table above). Arnold Hague has her in another Trans-Atlantic convoy that spring, namely the slow Convoy SC 170*, which left Halifax on March 17-1945 and arrived Liverpool on the 31st. The Norwegian Askepot, Biscaya, Brush, Chr. Th. Boe, Frontenac, Geisha (Commodore Vessel), Romulus, Tercero and Titanian are also named. The following month we find Brønnøy, together with Gabon, in Convoy OS 125/KMS 100*, which originated in Liverpool on Apr. 27 and split up on May 1 (link in Voyage Record). 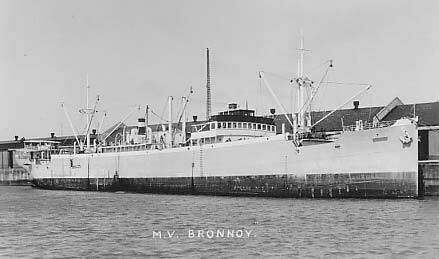 Both Norwegian ships were bound for Freetown; Brønnøy had sailed from Milford Haven on Apr. 28 and arrived Freetown on May 28, having stopped at Gibraltar from May 4 to May 20. Her subsequent voyages can be found on Page 4 (it'll be noticed that she had a long stay in Hull, as well as in Quebec that fall). It looks like Christmas and New Year's Eve of 1945 were celebrated in Norway. She later spent a long time at St. John, N.B., before returning to Norway - see Page 5. * The ON and ONS convoys mentioned here will be added to individual pages in my Convoys section in due course, with more information on each; in the meantime, the ships sailing in them are named in the section listing ships in all ON convoys and on the page for ships in all ONS convoys. The escorts for the ON convoys are named on this page, while ONS convoy escorts are listed on this page. The MKS and KMS convoys will also be added, but for now, please see ships in all MKS convoys and ships in all KMS convoys. Additionally, the entire SC series will be updated and completed (including the already existing convoys), see ships in all SC convoys (with escorts). Sold in 1949 and renamed Maur for A/S D/S Bjørn (Thv. Hansen), Oslo. Sold in 1952 to Genyo Kisen KK, Japan, and renamed Yasukawa Maru. Sold to Japanese breakers and sailed from Yokohama on Febr. 7-1962 for Yokosuka to be broken up. (See also the history on this external page). Back to Brønnøy on the "Ships starting with B" page. Other Ships by this name: Norway had another Brønnøy in the 1980's. This ship had originally been delivered as Barøy from Kaarbøs Mek. Verksted, Harstad to Ofotens Dampskibsselskap, Narvik on May 14-1969, 439 gt, in service Trondheim-Western Finnmark. Lengthened in 1973, 492 gt. Laid up at Langstein 1979-'80, sold on May 24-1981 to K/S Nord-Poolen A/S, Trondheim. Sold on May 27-1986 to P/R Brønnøy Ship (Petter A. Slotvik), Brønnøysund, renamed Brønnøy and placed in coastal service between the south and north of Norway. Remeasured June 11-1987, 299 gt. Placed in the DK-NOR service from Denmark to Norwegian ports in 1991 and still in same service in 1996. A/S Borgestad, Porsgrunn also had a Brønnøy after the war, delivered in July-1956, built at Kiel, 9173 gt. Sold in 1966 and renamed Avior, renamed Hadji Dimitar in 1970, Greek Apostolos M IV in 1980 - broken up in 1984. This external website has pictures and info on this ship. (Misc. sources, including Ofoten og Vesteraalens DS fleet list, Finn R. Hansen - ref. My sources).